As someone who is a recent post-grad and interested in entering a career in the nonprofit sector, I’ve been paying close attention to the relationships I have built over the past few years with various nonprofit and how they came to be. During my four years in college I was grateful to have had the opportunity to intern with five different nonprofit organizations in Boston and Los Angeles. In all five internship experiences, I was constantly impressed by how eager the organizations were to make a connection with me, meet with me in person, and discuss possible professional opportunities with their organization. I felt valued and appreciated as a potential employee or intern, even before I had a chance to actually work with them. Their level of engagement in my professional pursuits, passions, and previous work experience as a young person showed me how approachable, encouraging, and inclusive the nonprofit sector can be. As a college student, the nonprofit employees who reached out to me or took the initiative to meet in person with me after I had contacted them for an internship/volunteer opportunity, made me feel like my voice mattered and could potentially have an impact on their organization. Whether it was grabbing coffee with a potential Internship Manager of a local organization or Skyping with a nonprofit HR representative, they were sure to engage me in a meaningful and productive conversation about why I was passionate about their organization’s mission, how I could contribute to their organization, and how their nonprofit could benefit me. Although those can be standard interview questions, the way the conversation was approached and maintained was extremely personal and unique to me and my interests in social justice, nonprofit work, volunteerism, and advocacy. In fact, there were many times where the nonprofit employee would contact me first to follow up after our initial conversation which was an effective and individualized way to keep me engaged in their organization and internship/employment opportunities. Now that I am a few months out of college and am still interested in furthering my passions in the nonprofit sector, social justice, and volunteerism, I’ve been able to appreciate how engaged, enthused, and meaningful my professional networking opportunities were with local nonprofits. As eager, passionate, and caring 20-somethings begin to launch their career in the nonprofit sector, it’s important for nonprofits to be aware of the influential relationship they have the potential to foster with possible recently graduated employees. For many of my friends who entered the for-profit field, many of their application and hiring processes were very indirect and impersonal. Knowing someone within the company they were applying to who could pass their resume off to someone higher up was one of the best ways to ensure that their resume didn’t get lost in the shuffle. But very rarely did my for-profit sector friends get to grab coffee, Skype, and even speak with the leadership of the company or the person who would oversee them. 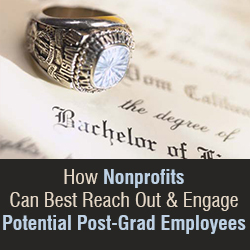 I understand that a for-profit’s capacity looks very different than a non-profit’s, but I use this example to emphasize the important role nonprofit professionals can play in bridging the gap of professional and personal with recent post-grads who are eager to dive into the nonprofit world. Nonprofit work is very personal, especially if you’re working on social, economic, political, and environmental justice, community development, and human/animal rights. Your work can be deeply connected to your community and society-at-large, so a lot of your own personal investment is necessary and important in order to mend the societal ills many organizations seek to combat. With that said, if nonprofit work is personal for many people, then the way nonprofits reach out to and engage potential employees should be personalized too. Time is valuable and many nonprofits don’t have enough of it. But, people are valuable too and that’s something that nonprofits very much understand and appreciate. With how people and cause-centered many nonprofits are, nonprofit professionals have the potential to create meaningful, individualized, and influential connections that could really benefit both your organization and the possible employee. These connections should not go unnoticed. Millennials are already well-connected, motivated, and ready to spring into their professional pursuits, therefore, making them advantageous relationships. Keep in mind; the nonprofit sector is increasingly getting younger, which makes these millennial connections even more crucial and valuable. From my experience as a millennial, we are also a very individual generation – we strive to make personal connections to people, things, and the world around us, we are in search for unique experiences, we’re constantly looking to progress in society, and have very specific goals and aspirations in mind. With this in mind, my charge to nonprofit employees and professionals would be to make your networking connections with recent post-grads earnest, personal, and matched in enthusiasm. Recent post-grads who are interested in making a difference and sparking change have a spirited determination that can be molded and furthered if given the right professional opportunities and channels – which is where nonprofits come in. If you’re looking to hire a recent post-grad as an intern or employee, when you reach out to them, make sure you take note of their passions, personal convictions, and unique experience – that’s what nonprofits did for me and I am extremely thankful for that.